On a field just outside of Roskilde, there stands a somewhat unusual wind turbine. Where common wind turbines have only one rotor, this turbine has four rotors mounted on a single tower. The project is called ‘Babylon’ and has been developed in a joint effort between the Danish wind turbine giant, Vestas, and researchers from DTU Wind Energy. Plougmann Vingtoft has helped Vestas patent this new, exciting technology. The four-rotor wind turbine was installed in April 2016, and in July of that same year, it was possible to reap the first energy therefrom. The turbine is a 74-meter tall prototype designed to help Vestas and the researchers from DTU determine, how the many rotors effect each other. In other words, it is at this point a test turbine developed to test this very concept, but down the road, Vestas hopes that the multi-rotor technology can open new markets for wind energy. The patent experts from Plougmann Vingtoft, who have been consulting Vestas on their IPR strategy for more than a decade, were involved in the multi-rotor wind turbine project from a very early stage. Vestas needed to test the prototype in full scale and under real weather conditions, which may be rather risky. You don’t put your innovative experiments on public display, like Vestas did with the multi-rotor wind turbine, unless your rights are sufficiently secured. For exactly this reason, it has been pivotal for Vestas to work strategically with patenting the multi-rotor technology: “It is important for us to initiate the patent process already in the early phases of the technological development. This way we can concentrate on testing and refining the product without having to worry about being copied,” says Kim Højrup Hansen, European Patent Attorney at Vestas. The bigger the rotor area, the larger output per turbine. This is why the wind power industry in many years have progressed towards increasingly larger turbines. However, there are also disadvantages connected with very large-scale wind turbines. When the rotors become bigger, they also become heavier. If the rotors become too big, their weight will cancel out the otherwise extra wind power output. The load on the tower and the blades also increase with size, so you’re aiming for a very fine balance. Furthermore, the large parts for the giant turbines demand special transport, which increases the costs of installing wind farms, and makes it difficult to transport the parts in areas with limited infrastructure. By installing several smaller rotors on the same tower, you achieve a larger rotor area without making the individual turbine heavier. It is also easier and more cost-effective to transport the smaller blades and towers, which makes it possible to install them in areas that are otherwise difficult to access with special transport. If the multi-rotor project turns out to be a success in practice, it can clear the way to whole new markets for Vestas and the Danish wind power industry. To open up the possibilities for sustainable wind power will not only be advantage for Danish export, but also for the climate on a global level. The American, Charles F. Brush, installs the first automatic functioning wind turbine for electricity production. The Dane, Poul la Cour, installs “Forsøgsmøllen” (the test turbine) by Askov Højskole. Poul la Cour discovered that fewer, but faster, blades were more effective at producing electricity (direct current). He is attributed the title as the “father” of the Danish wind turbine industry. The German inventor, Hermann Honnef, draws a multi-rotor design for a 250-meter tall turbine with three rotor turbines. F.L. Schmidt installs a three-blade wind turbine at Bogø. The Bogø turbine is converted into producing alternating current. Johannes Juul, student of Poul la Cour, invents the tip brake, which stops the turbine at high speed. A very similar system is still used to this day. Vestas launches its first wind turbine with a capacity of 30 kW. A new generation of 55 kW wind turbines see the light of day. This was a commercial breakthrough for wind energy, as the price of electricity from wind turbines dropped by 50% per kW. The world’s biggest multi-rotor wind turbine is installed in Rotterdam, Holland. The turbine had six two-blade turbines and a capacity of 450 kW. However, the two lower turbines had to be removed shortly after the installment. The first offshore wind farm, Vindeby offshore wind farm near Lolland, is installed. 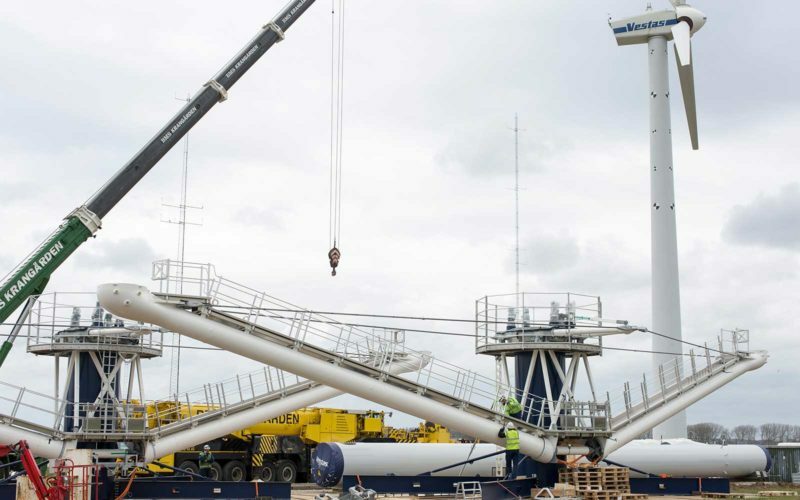 Vestas installs a wind turbine prototype with a capacity of 1.5 MW. Vestas and Mitsubishi Heavy Industries installs the world’s biggest wind turbine in Østerild with a capacity of 8 MW. Vestas installs its prototype of a multi-rotor turbine.